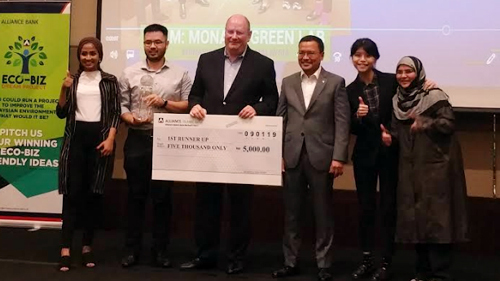 Five Monashians made the University proud when they emerged first runner-up in the Eco-Biz Dream Project 3 on 9 January 2019. The team, also known as Monash GreenLab, won RM5000 cash prize, certificates and a trophy. Organised by Alliance Islamic Bank, the competition saw teams working on solutions to help revitalise Sungai Kerayong in the Klang Valley. Of the estimated 150 proposals and 750 students who submitted their entries worldwide, only the top 25 projects were selected for the first round. These 25 groups were then given mentoring and workshop classes, after which only the top 10 were selected, to compete in the final round. Team Monash GreenLab, consisted of three PhD engineering students; Fang Sheng Lim (Mechanical Engineering), Arshia Fathima (Chemical Engineering), Istiaq Jamil Siddique (Mechanical Engineering), and two undergraduate students from the School of Arts and Social Sciences; Jia Yi Ng and Saima Islam. Their project aims to achieve this goal by harnessing renewable energy from the flowing water with the river cleaning and energy regeneration (RCEG) system. This is by using a low head hydropower integrated with an automatic solid trash trapping system. The solid waste collected from the river, which are mainly plastic, will then be converted into value-added products, such as houseware, industrial products among others. On top of that, the generated electricity will be supplied to a plastic recycling plant, local businesses, and to beautify the river bank. In turn, this strategic implementation and usage of a renewable energy generation system will encourage the growth of the community’s socio-economic conditions, the beautification of the surrounding area, as well as the development of a sustainable river economy. This project will be implemented with the help of the local Kerayong community and smart partnerships with government agencies, private industries and academic institutions. It took approximately four months to plan and develop the project, with constant guidance, training and attending workshops by eminent leaders and academicians. Presently, the team is in the phase of moving the project to a commercial level, by collaborating and establishing partnerships with relevant stakeholders. They hope to establish their own social enterprise in the next year. Congratulations and all the best team Monash GreenLab!